I Love Ebay! – MY LIFE! Home My Life	I Love Ebay! One of the things that really annoys Sam is a saying I use. This was set as the strap line for an employer which summed them up completely. As I love working and business in general I use it all the time, mostly just to wind her up though! Sorry Love. Part of this is I started buying and selling a bit on Ebay. I don’t really do it for the money, just for fun really. It all started when a lot I was looking at and considering was going for a ridiculously low price. By low I mean the seller was basically giving it away. Why not I thought , so I put a very low bid in, and won! The lot was a box of 100 baby items. it range from bath puppets to Shampoo visors and much more. Once it was delivered I photographed all the items and uploaded them onto Ebay to sell individually. Low and behold they started selling! It was really a little effort for a little gain in terms of finance Once I have made my money back and some profit I invested in another bulk lot of Socks, believe it or not! Again I broke these down and am selling them individually! I have had a couple of disasters however. I purchase 250 england wrist bands which I thought would sell in the run up to and during the European Championships. I sold a couple in the run up but. given England’s poor show, I still have the bulk of these! I have to emphasis that I don’t make a whole lot of money from this but it is great fun! I have read a number of stories and blogs from people wo have made Ebay into a business or a profitable hobby, but unless you fall really lucky, this wont happen over night. 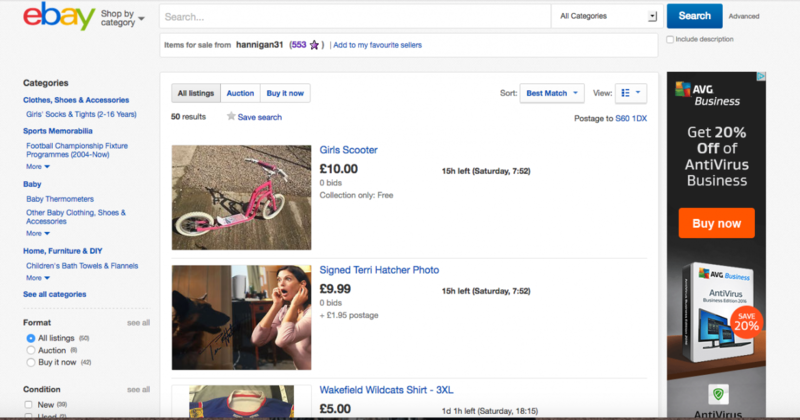 Don’t fall into the trap of thinking Ebay is a get rich quick scheme…. I you want to have a look at what I am selling, please use this link and see if anything takes your fancy! Curry, Lucy eating Lemons and BINGO!